Potato chips, pretzels, a band named Mas Cantes singing “Proud Mary,” “Superstition” and other American songs—where are we? Why in Provence, of course. More specifically, in a small village. Most specifically, at the local cave coopérative. When are we? The Saturday of Ascension weekend. France is a place that has mostly given up on religion. It is nonetheless protective of religious holidays. Since Ascension always falls on a Thursday, this gives workers the opportunity to faire le pont as they call it, make a bridge from the holiday to the weekend by taking Friday off. 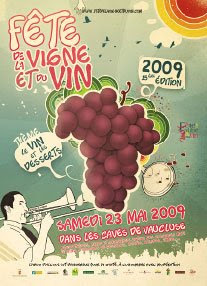 For the wine producers in the Vaucluse, Ascension weekend is time for the Festival of Vine and Wine, Fête de la Vigne et du Vin, now in its 15th year. Each cellar organizes its own events. Some transform their parking lots into a showplace for classic cars, others sponsor hikes through the vineyards, yard sales, markets featuring local fruits and vegetables, talks, Bocci tournaments (called boules or petanque here), even the preparation of a giant truffle pizza. Our local wine cooperative offered dune buggy rides though the vineyards, an exposition of viticultural equipment, displays of vines, a vendor selling cherries just now ripening, and a dinner (preceded by the potato chips and pretzels appetizers, serenaded by the group with the Latino name). The whole event was low-key. Official opening time for appetizers and dinner was 6 p.m. Having spent long enough in the area to be acquainted with local time consciousness, we did not arrive until 7:00. By that hour there were people milling about the table where before-dinner wine was served. The wine cellar’s parking lot was divided into two areas. One was for the display of equipment used in the vines. The other had long tables set up for the dinner. Around 8:00, the women who staff the cellar began distributing plates of food, an assiete provençale, salamis, paté, and a prosciutto-style dried meat accompanied by lettuce, cornichons, olives and a roll. The official notice had stated that the price of dinner would include one glass of wine to accompany the main plate, one to accompany the cheese course, and one with dessert. This being France, the one glass rule was ignored. Instead, bottles were placed on the tables and people just helped themselves. On our table were rosés and whites. The easy-going style of the evening meant that, though our table had plenty of wine, no one ever got around to bringing us a bottle of either a red or the sweet wine that was to go with the strawberries and whipped cream dessert. Seated on one side of us was a Swiss cyclist. Scraping together bits of French, German and English we managed a passable conversation. He makes an annual pilgimmage to climb Mt. Ventoux, does social work near Zurich, and, after dinner, was driving all the way back, a 7 or 8 hour trip. Needless to say, he had only one glass of wine. On the other side was an actual vinter, a member of the cooperative, someone who was a second generation grape cultivator. He explained how the cooperative helps small owners like himself. It provides not only up-to-date facilities, but also hires experts who help produce the vintages. These advantages are expensive and would be prohibitive without the sharing of costs among cooperative members. 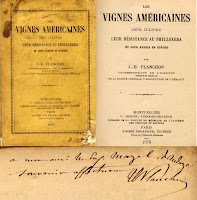 Wine cooperatives are a product of the early 20th century. The 19th century had ended on a difficult note. There was overproduction and a subsequent drop in prices. Most significantly there was phylloxera, an aphid that kills plants at their roots. It had crossed the Atlantic with American vines that had adapted to its presence. Not so French vines. About ½ of France’s vineyards were devastated. The solution was finally to plant American rootstocks. They had the advantage of resistance to phylloxera. They also had a major disadvantage. Their grapes produced bad wine. The compromise solution: graft French grape varietals onto the American rootstocks. Cooperatives helped small growers survive the difficulties at the turn of the previous century. Today’s challenge is not biologic, but economic, a much more competitive international environment. Just as cooperatives made a difference at the beginning of the 20th century, so they hope to do so in the early 21st. They make it at least possible that our neighbor’s fondest hope will be realized: seeing his grandchildren tend the same vines his own father did.